When deciding what to add online, you have to remember that: 1) People are different. 2) Good content for one person may not be good content for others. Why do we put content online? As businesses, we put content online to increase connectivity people have with us so we can do more business. Period. But remember, people come in all kinds of packages. Some people develop connections when you make them laugh. Some people develop connections with business when you save them money. Most people develop connections when they get to know YOU, the business owner. Writing 500+ words or more, can attract Google and help deem you as an expert but, with the attention spans of people these days, this reaches a different audience. Why are these good? Deep connections to those that read it. You are giving your value and providing confidence to those that may want to purchase. Why are these posts not so good? Fewer people take the time to read these posts. Keep reading this post for a surprise at the end. Who this content reaches? People that are making a serious decision on health, finances or other emotional & knowledge based buying decisions, can be highly influenced by this type of post. The Math: Reach lower % of your audience. Bigger Connections. We all like to feel we are getting value for what we are paying for. Sometimes, all it takes for some people to "try" your services is some assurance of value. Why are these good? These posts are quick to read, easy to create, and online, these posts can be shared to reach a broader audience. Why are these posts not so good? As long as people respect the value you are offering, these can be an effective piece of content. What to make sure of? Make sure, when you offer a promotional post, you use it to engage with the new prospect. Your staff should be welcoming, and understand the need to develop a relationship or take the time to educate the consumer as a result of the promotion. There should be no disrespect given to the consumer that comes in because of an enticement. The Math: Reach more people. Can go viral. Lower depth of connection unless you consciously upgrade the connection. A meme is an image with some words of humour or wisdom. Why are these good? Memes can be fun and provide a good BRANDING opportunity. People love to share these on social as well. Sometimes less is more and memes take advantage of the idea that a picture is worth 1000 words. Why are these posts not so good? Well, because they are easy, people may just string a bunch together and NOT think about their message and branding. Also, how many inspirational posts can we read in a day? The Math: Make sure you include your brand and website on a meme post. They can reach MANY people, but will they reach the correct people? We are Klusster Media Inc. We have been fortunate enough to reach 35,000,000 people online. Now it's time to get your clients found online. 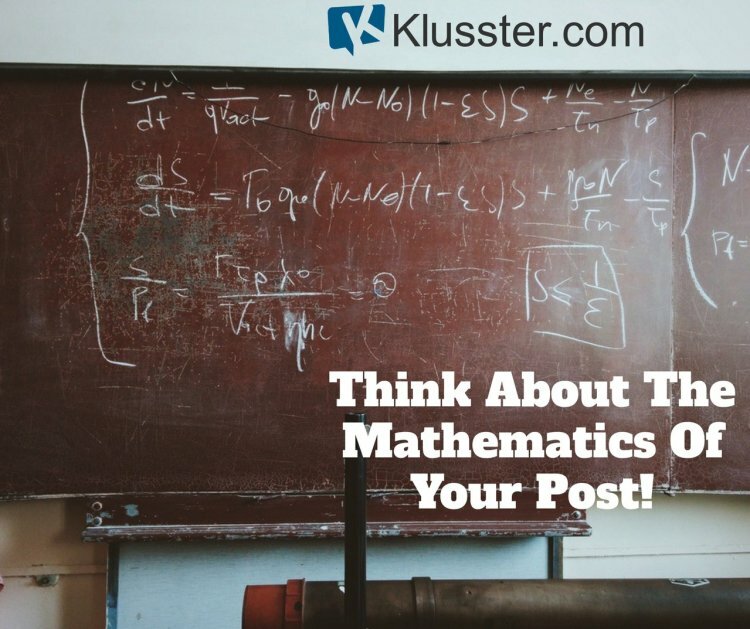 Use Klusster to build a publication and reach more people online through consistent creation and distribution of content. Want to build more business? Register for our Wednesday Webinars, and we will take you through the ins and outs of online publishing.